WHAT COLOR IS THAT CK722? It seems that many of us who became familiar with the CK722 during the 1950’s and 1960’s have a memory of what the device looked like - specifically, the color of the CK722. As it turns out, there were three distinctive case colors, each representing a specific time frame. So, you may remember building a radio with a CK722 that was a deep blue color, while someone else is sure the case was silver and a few of us “old timers” may have used the original black plastic unit. The CK722 came in three separate colors - black, blue and silver. The original CK722 was manufactured in a black plastic case, with white lettering. The date code for this black unit was a three digit number printed on the opposite side of the case from the CK722 id. The first digit represents the year, starting with 1952, and the last two digits represent the week of the year - so, 3-06 would be 1953 week 6. The earliest date code I have seen on a black CK722 is 245, which would be 1952, week 45. Sometime in 1955, the blue metal case style was introduced. Here again white lettering is used for the CK722 id and for the three digit date code. For the blue units the date code is printed on the same side of the case as the id. The earliest date code for a blue unit I’ve seen is 527, which would mean 1955 week 27. The blue metal units continued until sometime in the late 1950’s; the latest date code I have seen for a blue unit is 630, which would be 1956 week 30. The silver metal style was the last type of CK722 to be manufactured. The latest date code I have seen for a silver unit (these were four digit date codes for the most part, with the exception of a few 1960 units) is 6352, which would represent 1963 week 52. The date code and the CK722 are printed in black on the same side of the case. 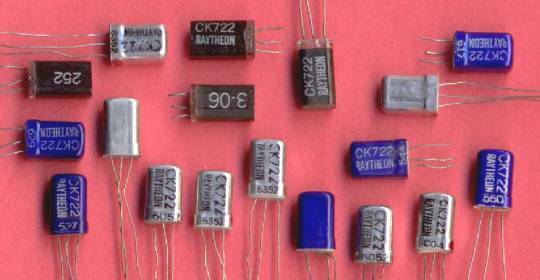 Apparently 1964 was the last year of manufacture for the Raytheon CK722, since that was the year when the Lewiston Maine Raytheon transistor manufacturing plant was closed down - this was the last germanium transistor manufacturing plant operated by Raytheon.